As many of you may know we have created a Tong Shu almanac each month for the last eleven years and will continue to do so free of charge. The tong shu almanac page is visited by so many people each month as they know with good auspicious date selection they can increase their chances of success of many tasks significantly. 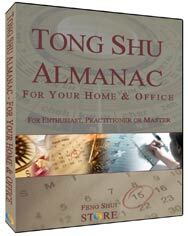 The tong shu almanac we produce on our website each month is very straightforward compared with this software, as the dates and information provided to you is specific to your date of birth and of course with the software you can select dates from today to sixty plus years ahead with no absolutely restrictions at all. Millions of Chinese language copies of the Tong Shu almanac are printed every year and to my knowledge there are only a few English printed worthwhile versions available and these are just generic basic versions in printed diary and on-line versions that charge hundreds of pounds for annual subscriptions and they are alos very limited. Business version: The main difference in the business version is the software can be personalised for your company and details like logo, address, phone etc are added into printed/emailed reports. Please only buy this business version software if you intend to run a business from it or can see a benefit of personalising your printed reports, you get exactly the same software as the home & office version, the only difference is your company or personal details can be added to the software printed and emailed reports that are sent to your clients. System requirements:Please note that Software is available for Microsoft Windows based PCs and works on nearly every version including the new Windows 7, Vista & all Windows XP versions although we do not support any other older versions of Windows. It is designed to run on Microsoft Windows based PCs with a minimum system requirement as follows:You are purchasing a one user, one computer licence unless stated otherwise.